This month’s artifact is an engraved slab of granite that is more than ten feet tall. It was discovered in 1896 in Western Thebes, Egypt by Sir Flinders Petrie and it contains the oldest* certain reference to “Israel” outside of the Bible. It is commonly referred to as the Merneptah Stela and the text was carved c. 1210 BC in hieroglyphs under the auspices of Pharaoh Merneptah. 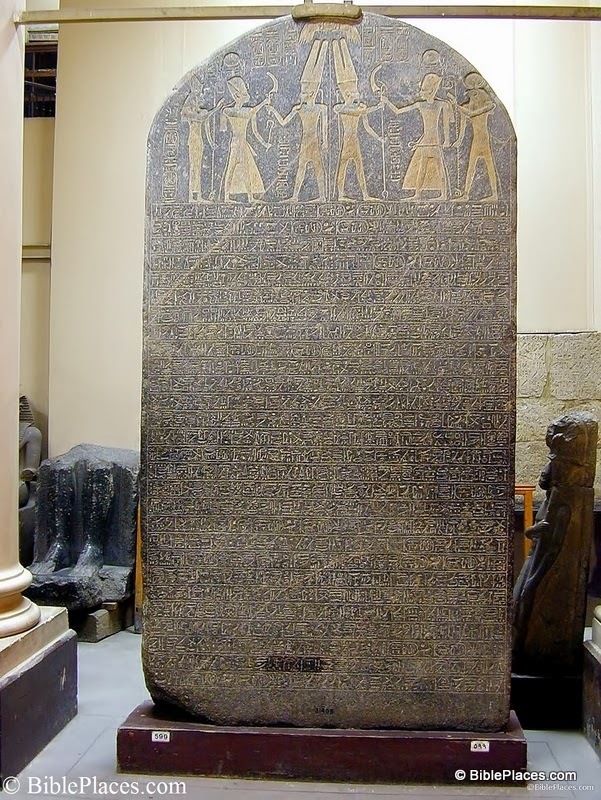 It is now located in the Egyptian Museum in Cairo, and the word "Israel" is in the darkened section in the second line from the bottom that can be seen more clearly by clicking on the photo to enlarge it. The wording on the stela is hymnic in nature and recounts the military exploits of Pharaoh Merneptah, especially against the Libyans. Indeed, of the 28 lines of inscribed text, 23 deal with the Libyan conflict. It is only in the later part of the inscription that Israel is mentioned, and in this regard the Israelites are referred to with the language designating them as an ethnic group instead of a settled nation state. This description is fully in line with the Biblical portrayal of the Israelites during the era of the Judges, which represents them as a people group lacking in central leadership and without a capital city. *The Berlin Pedestal may contain a reference to Israel that is older than the Merneptah Stela. See: Israel in Canaan (Long) Before Pharaoh Merenptah? A Fresh Look at Berlin Statue Pedestal Relief 21687. Journal of Ancient Egyptian Interconnections 2.4: 15–25. Mike - thanks for this post and the beginning of a new series. I am looking forward to it! Todd: I remembered that you wrote this article regarding the Merneptah Stele. (I think it may have appeared in Artifax.) I actually thought about adding some of the comments you expressed in the article to my post today; but decided to go shorter with this initial one in the series. On the other hand, your points are quite important, and I thank you for adding them. Could you please give a full reference to the article on the Berlin piece? Author's full name and a date would be helpful. Paul - the authors are Peter van der Veen, Christoffer Theis, and Manfred Görg. Published in 2010. The article is online here.